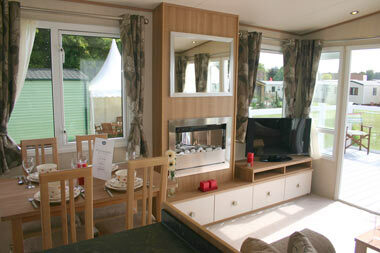 The Sunningdale is one of six new models which ABI has introduced for the 2013 season. The headline in the brochure refers to so much light shining through because there are windows on all three sides. But we have to say that we would be hard put remember that last time we were in a static caravan which didn’t have windows on all three sides. That said, inside it is indeed light and airy thanks to the pale woods and paints used on the interior. There are in fact four models in the range starting at 32ft x 12ft rising to 38ft x 12ft, this latter one being a three bedroom version. The other three are all two bedroom models, with the one reviewed here being the 38ft x12ft two bedroom featuring a domestic style bath in the master bedroom en suite. The home has a painted chassis as standard with a pre-galvanised one available as an option. We think this would be a well worthwhile additional cost especially if the home is to be sited anywhere near the coast where salt spray would be a definite hazard to a painted chassis. Woodgrain aluminium cladding is also standard with no other options available, although the external walls can be upgraded at extra cost, whilst the windows can also be upgraded to UPVC thermoglas double glazing. And for anyone wishing to use the home throughout the whole year, details of the company’s winter pack upgrade are available from any ABI dealer or park. As is standard in many static caravans, you enter the Sunningdale through a door into the kitchen area. Immediately on the right is the boiler cupboard followed by a base unit incorporating a four burner hob and double oven. Opposite the entrance is the sink unit on the home’s rear wall and next to it is space for an optional tall fridge/freezer. However there is no provision for a dishwasher or washing machine – optional or not – which we think, especially in the case of the dishwasher, is a pity since it would mean less holiday time spent washing up! To the left of the entrance is the dining area which comes with a rectangular table and four chairs. Again, as in many static caravans, the area forms part of the lounge. Along the back wall is an L shaped sofa with a pull out occasional bed. Facing it, next to the dining table, is a large wall unit incorporating an electric fire and storage cupboards, plus a TV point. The door from the kitchen leads into a dog-leg corridor and the night time accommodation. First on the right is the second bed which is somewhat unusual as the two divan beds are positioned at 90 degrees to each other so maximising the available space allowing a double wardrobe to be included. Opposite the second bedroom is the home’s shower room. 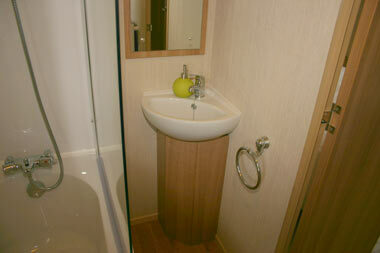 This is a good size and has a large rectangular shower cubicle, plus a low level toilet and a washbasin. At the end of the corridor is the master bedroom which spans the full width of the home. 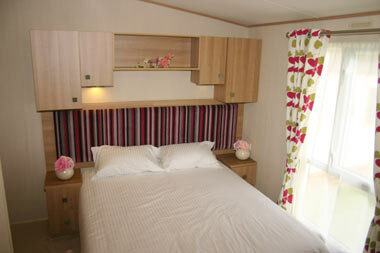 It has a double bed with lift up storage, plus bedside cabinets and a large padded headboard. At either side of the bed, above the headboard, is a pair of wall cupboards separated by an open shelf compartment. To the left as you stand at the foot of the bed is a large unit comprising a his and her wardrobe with drawers in the base, whilst in the corner opposite the bottom of the bed is a small dressing table complete with mirror, two gang 13 amp socket and a padded stool. There is also a TV point in the room. But what differentiates the unit from others in the range is the en suite, which has a domestic style bath with a shower on the wall above the mixer taps. Next to the shower screen running along the edge of the bath is a corner washbasin whilst at the foot of the bath is a low level toilet. We can’t say that there is anything which really makes the Sunningdale stand out from the competition, but having said that the company’s reputation for building value-for-money static caravans is definately in tact and this is a safe bet for any buyer. *The price quoted is ex-works, includes VAT, but excludes delivery, installation and any other costs as determined by the manufacturer, distributor, dealer or park owner. Please check the price carefully before you buy as it can vary considerably dependent on many factors including the geographical location of your chosen park. How do you drain down your static? I love the bath in the ensuite as my son who is disabled cannot manage a shower and always asks for a bath when he stays with us in our present caravan. Absolutely beautiful and two loos! Good width and lovely design! How does it compare to your ST DAVID? We have just purchased 1 of these, is there anywhere we can get the matching bedding? ABI don’t seem to produce a 13 foot model in the Sunningdale. Click here to see the model floorplans offered by ABI. We couldn’t really advise on price. You’d be best speaking to your chosen park or an ABI dealer. 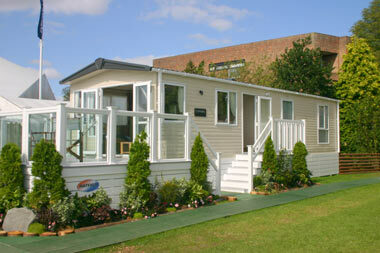 You could find one of these on the ABI Park and Dealer finder webpage. Love the Sunningdale, especially the bath and large bedroom. Two main faults, no shelving in bathroom and no splash backs behind either wash hand basin. Extra?? insulation under floor with winter pack doubtful. We would recommend that you speak to the park operator before making any changes as such modifications could potentially devalue the caravan. It may also be worth enlisting the help of a specialist such as The Caravan Warehouse (see website here) to carry out the work. 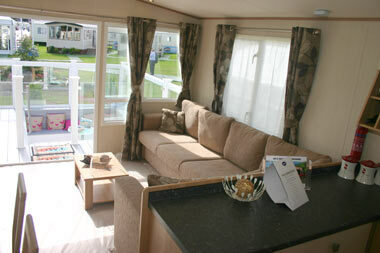 We have 2013 3 bedroom Sunningdale,this caravan is ideal for people with larger families. This van will sleep 8 persons in comfort, it is of residential spec,we bought this van from new and have looked at other vans on offer at the moment. 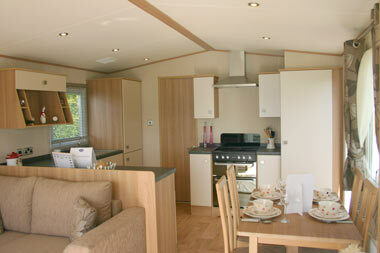 There are not many new caravans with 3 bedrooms at the moment as good as this unless you go for a lodge type van. Hi Francesca, we checked with ABI and they think it’s a ‘Kentmere’ by Plastech. Hope this helps?